It was like the school disco all over again. As some unexpected spring sunshine brightened up the Finchley Road last Sunday lunchtime, 15 of us were waiting nervously in a room in Swiss Cottage’s sleek new leisure centre to be borrowed as “books” in the UK’s first ever Living Library. The idea, which comes from Scandinavia, is simple: instead of books, readers can come to the library and borrow a person for a 30-minute chat. The human “books” on offer vary from event to event but always include a healthy cross section of stereotypes. Last weekend, the small but richly diverse list included Police Officer, Vegan, Male Nanny and Lifelong Activist as well as Person with Mental Health Difficulties and Young Person Excluded from School. I was there as Gay Man. In the catalogue we had been tagged with the kind of negative attributes that readers might expect to encounter. Male Nanny was down as “twee” and “child molester”. Police Officer was filed under “corrupt”. Mine included “very well dressed” and “has some sexually transmitted disease”, though thankfully there was no mention of Barbra Streisand. We had, to be honest, a slowish start and spent much of the time “reading” each other but eventually the librarians started to pop their heads round the door with readers’ requests. First out were Social Worker (“naive”) and Immigrant (“wasting resources”) and then Muslim (“beard”) was borrowed for a quick chat, presumably about bombs and his attitude to women. The rest of us tucked into the sandwiches and pretended that we weren’t at all worried about being, almost literally, left on the shelves. I was beginning to think that the denizens of this particularly liberal part of North London had had their fill of Gay Man, when I was introduced to my first reader, a young Romanian woman who was now living in London. Up to this point I hadn’t really thought about what being a book entailed and as we sat down I wasn’t sure if I was meant to start at chapter one or if she could just dip in where she liked. Luckily she had already borrowed a couple of us by this stage and was on a roll. We launched into a frank conversation about how much seeing two men kissing in Leicester Square had unexpectedly upset her. We traded impressions that we had of gay people and Eastern Europeans and politely acknowledged how ill-informed we both were. And then our time was up and she took me back downstairs to the desk. It was short and sweet, and I realised that I needed to know more Eastern Europeans. I had been borrowed by a trainee ordinand to the Church of England, and if there’s any organisation that’s facing some local difficulty with Gay Man, that’s the one. I expected a rerun of my first outing, perhaps with a small detour via God, and was mentally revising some of my bons mots from the previous session when it turned out that this was going to be much more like a Q&A. Did I think civil partnerships would make gay relationships more stable? Should children be brought up by gay parents? How could the Church be more welcoming to gay people? It was slightly unsettling, not least because I wasn’t sure that I had the answers, but after 30 minutes of this he seemed happy enough. I didn’t learn much about Church of England ordinands. Downstairs the Living Library’s founder, Ronni Abergel, was elucidating the movement’s aims. ” We work on the principle that extreme violence and aggression happens between people who don’t know each other. 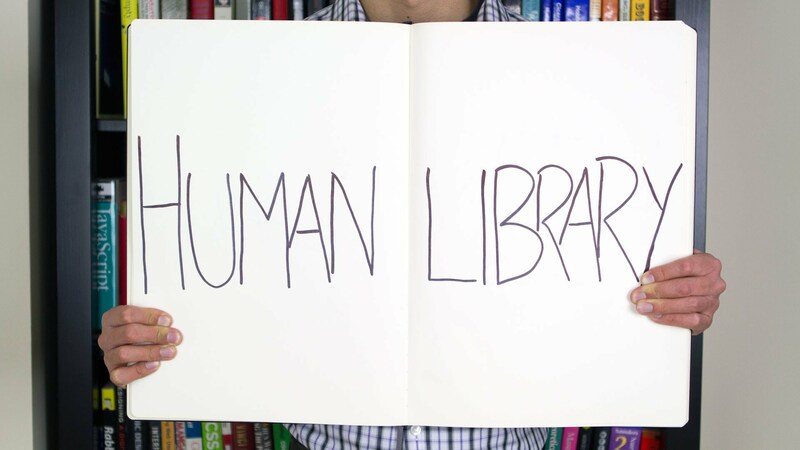 So the Living Library can bring together people who are otherwise unlikely to meet. We want to show that not every Muslim wants to blow you up, not every policeman is a bully.” The first Living Library, he said, had been held at a music festival in Denmark in 2000 and since then had toured extensively, mostly in Norway and Hungary. This was the first of “many” libraries that Abergel had planned for the UK and he was working on fine-tuning the line-ups for future events around the country. By now it was nearly closing time and most of us were assuming that we had seen our last reader when a librarian came in with the news that two teenage boys had asked to borrow me. Earlier in the day, Alternative Medicine Therapist (“hippy”) had said to me that she was learning a lot about her own prejudices from readers and her words came flooding back when I found two young black men waiting for me at the desk. As I sat down with them I braced myself for a stream of invective when one them gently asked, “Do you experience homophobia often?” It surprised me to find myself saying yes and we began one of the most fascinating conversations I have had for a long time. They said that they both had often had strongly anti-gay opinions. I said that if I saw them on the top deck of the night bus I’d probably go back downstairs. And once that had broken the ice, the conversation became an exhilarating opening of hearts. It was a shame we didn’t have more time to talk – 30 minutes can pass very quickly – but I left with real hope. If all young people were like this, I felt, the world would soon be a better place. We regrouped and champagne was popped as the final day’s scores were added up. In total we had been borrowed 47 times, almost 24 book hours of (presumably) enlightening conversation. Most of us had seen three or four people. Immigrant and Disabled Person had been especially popular and were looking a little weary. But the most borrowed title by a long way – the Living Library’s Josephine Cox if you like – was Ex Gang Member. Of course. Even in diversity heavy London, who could resist a book like that?